It’s a gentle forest with lots of leaves and tree stumps, music and soft lighting. Stephanie Williams’ set is carefully contrived not to distress any member of the six audience members (the show is limited to just six and their carers) who have profound and multiple learning difficulties (PMLD) but it still manages to hit the wow button when each group of two or three people is enclosed in a leafy shelter, for example, or when they are invited to hold white helium balloons to represent moons. And the climactic storm with real rain and wind is terrific. The really ingenious thing about this show by Frozen Light  is that it speaks to all five senses. Yes, even taste as everyone gets a hygienic, oral squirt of fruit and a dried apricot to munch. 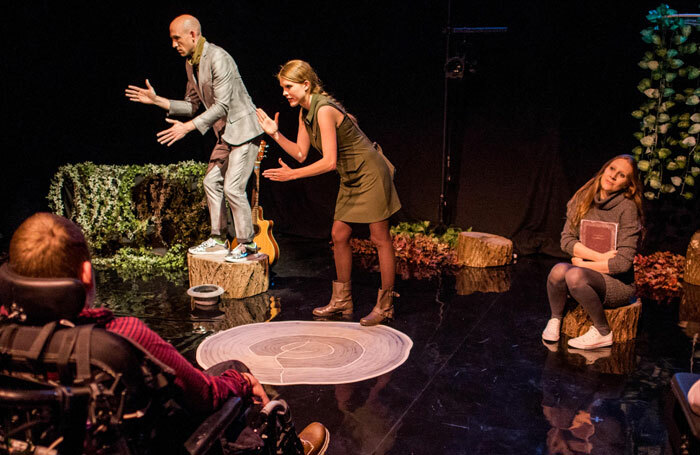 But it also manages to present a proper story about two lonely people wandering in the forest who need to meet and help each other with a spoken – and signed – narrative which uses splendidly clear language unpatronisingly. The whole venture is extraordinarily inclusive. Lucy Garland has a great gift for communicating through smiles and laughter which enables her to reach every audience member with friendly, but skilfully judged intimacy. Amber Onat Gregory is a sensitive actor who conveys a lovely sense of being lost and unhappy. Al Watts is an accomplished actor musician leading the singing, playing piano, guitar and clarinet and often a vocal continuo from the keyboard. It takes a very special sort of talent to work appropriately – thinking all the time on your feet – with a potentially unpredictable audience. These three have it in spades.